6.6 percentage points was the average lift, but some vertical-level results were impressively higher. In CPG, top-of-mind awareness was 11.1%, and search ads lifted top-of-mind awareness by an average of 8 percentage points to 19.1%. In auto, there was an average lift of 9 percentage points. Those are numbers any brand manager would be glad to see in the morning report. What's behind these big increases? In part, simply this: search ads reach people who are already in a highly receptive mindset. After all, they are actively searching for topics related to your business, product or service. If your brand appears front and center in that moment, as they search, there's a strong likelihood they'll remember you. Or to say it more simply: search ads can help build brand awareness. There's a lot more on this study - read it now on the Think with Google site. Everyone knows that search ads are for direct response, right? But what if it turns out that search advertising also has a powerful effect on branding? That's exactly what we learned from a new meta-study run by Google and Ipsos MediaCT in 2013. We partnered with Ipsos to run 61 studies across 12 verticals, from auto to retail. 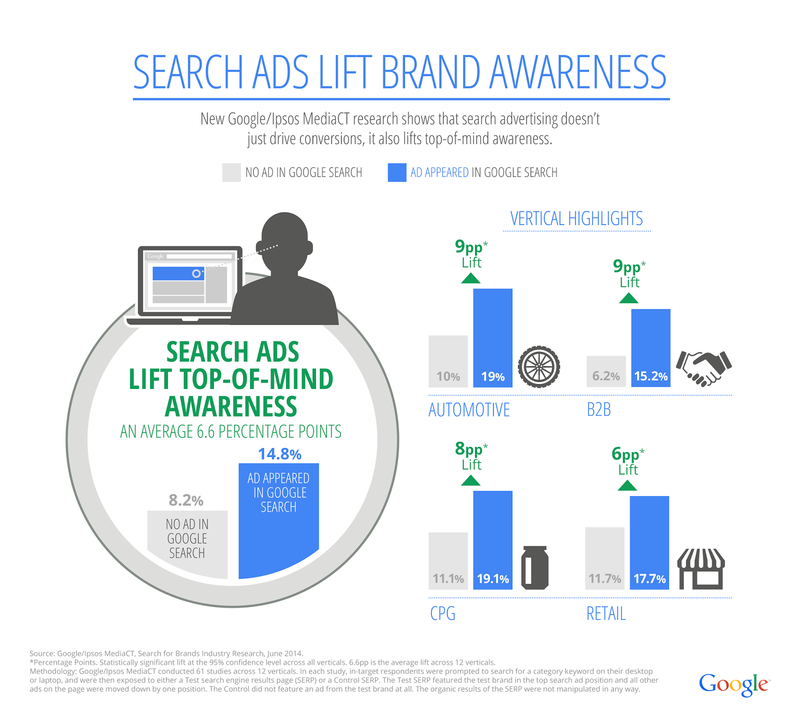 Here's what the study found: search ads lift top-of-mind awareness by an average 6.6 percentage points.